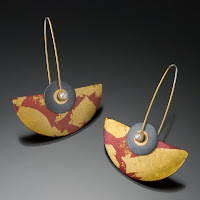 Tammy Kirks: Modern Granulation and Pop Enamels! 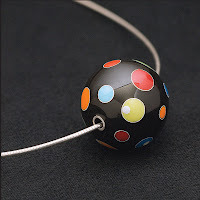 I smiled when I saw Tammy Kirks' Red Bee website with "pop art" influenced enamels. And I love her concept of "modern granulation". 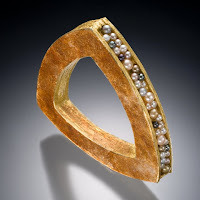 I think my favorite profiles are with designers who made jewelry design a second career...just like me. I took a granulation workshop with Doug Harling about five years ago and loved the technique, but didn't like the final look. It was too fussy for my taste. Once I started researching artists who do granulation I found some work of John Paul Miller's from the late 1960s-early 1970s. He was using chips of metal to create a different look and I loved it. Now most of my granulation pattern ideas come from stonework from the mid-century, architecture by Frank Lloyd Wright and geometric patterns. 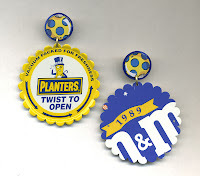 I'm getting most of my enamel ideas from the 1960s and 70s. I love patterns by Pucci, Marimekko, Vernor Panton and other designers from that era. I've always been drawn to pop art so I guess it carries over into my work. Textile and furniture designs of the 1950s and 60s are prevalent themes in my work. The use of geometric patterns is recurring, but the circle is my personal favorite. The reason is because it signifies completion and perfection, two characteristics I strive to achieve in my designs. My work can be summed up as simple and modern. 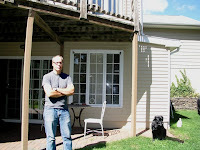 I was a graphic designer for 14 years before I burned out and quit my job. A friend encouraged me to start beading and I did that for about two years before becoming bored with it. I decided to take a class at Missouri State University in metals/jewelry and was hooked before I finished my first project. What have you found to be the most challenging and enjoyable aspects of trying to make a living at jewelry design? The most challenging is creating production work because it's what sells. I'd rather devote my time to creating artistic pieces, but the production lines are my bread and butter. I enjoy granulation the most because I do each piece for myself. I make what I like and hope someone else likes it too. I've had to raise my prices and I don't work with as much gold as I'd like. I created a gorgeous 22K granulated ring this past January but I can't afford to make another one right now. I wear the one I made so people can see my work in gold and it's a good advertising piece for me. Word of mouth. I'm terrible at marketing myself! I worked at an advertising agency for five years and am great at promoting others, but I'd rather spend my time in the studio than marketing my work. Just do it! Find your voice and follow it. There are so many designers out there that it's easy to compare yourself to others and get discouraged, but there's room for everyone. Take as many classes and workshops as you can so you can learn as much about metal as possible. You don't have to do every technique you learn, but it's good to experiment. I try to take at least one class and one workshop a year. 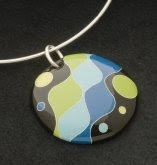 Tammy's work can be found at boutiques throughout Missouri and Tennessee. I LOVE the granulation work! 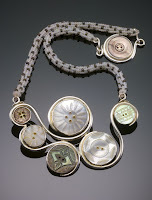 Alice Sprintzen: Amazing Found Object Art Jewelry! I found Alice Sprintzen through Ganoksin's Orchid Gallery which by the way, has just been overhauled. Orchid is certainly the most valuable forum site in our industry and now it's even better with new bells and whistles! I may have developed my approach to jewelry design back in childhood when I accompanied my parents beach combing. I have always enjoyed the hunt. There is something around every corner that cries out for fresh consideration - a new context in which to reinvent the ordinary, making it extraordinary - be it in the realm of the mind or the work of the hands. I work primarily with found objects. It is a challenge to combine materials without using heat (which would destroy most found objects). Cold connections, including riveting, sewing, lashing and wrapping are the methods I most often employ to connect found objects to one another and to metal. I use traditional jewelry making techniques for the parts of my works that can be soldered, hammered, etc. It is also a challenge to harvest the "found" materials. For example, I have driven from one body shop to another in search of car tail lights in the disposal pile, sometimes being rewarded with large chunks of cars from which I had to extract the plastic. Car plastic is much stronger than I had imagined and takes the great force of a hammer to break into workable pieces. It is actually a rather dangerous process and one has to take care not to get cut. My jewelry is, by its nature, a statement about society. It is, by implication, pro-reuse, and anti-consumption. It elevates ordinary materials to diamond status - at least that is the challenge. It is about finding beauty and humor in the ordinary. It is important to work hard for just causes but it is also important and soul saving to do it with a sense of humor. I wear my own jewelry most of the time and people seem to derive pleasure from it. It provokes a variety of reactions - most accompanied by a chuckle. I'm repeating myself, but in my opinion, humor is a "must" for dealing with the challenges of life. People also connect to specific objects in a piece, which may conjure up a memory, or evoke a metaphor that resonates with their own experience. I am also the lucky recipient of numerous "goodie bags" presented to me by friends who know that there is no better gift than a good rusty found object. They are joining me in the search and I feel they are part of the process of my work. I enjoy surprising them at that moment of recognition when they notice their contribution in a completed piece. I first came to jewelry design as a child, weaving beads on a cigar box loom, creating little people in tiny beads. The world of creating objects has always been an integral part of my life. As an adult, I majored in sculpture in art school, feeling more in tune with three-dimensional materials and techniques to get my ideas across than with the required two-dimensional studies. The school that I attended did not offer jewelry making. If it had, I'm quite certain that I would have been drawn to it like a magnet. I love to manipulate materials and especially appreciate the resistance, technical challenges and personality that each material/object brings to the table. I am sure that my mother, who was a serious artist, influenced me in some ways that I may never consciously completely know. As a child I watched her paint in our small kitchen/dining room, sometimes through much of the night. I have also been influenced by many jewelers including Fred Woell, Kiff Slemmons, Ramona Solberg, Bruce Medcalf, Robert Ebendorf and Laurie Hall, all of whom I admire enormously. Africa Adorned, by Angela Fisher, is one of my favorite sources of inspiration. I also find inspiration in the materials and the objects themselves. I spend at least half of my time manipulating the components as I work spontaneously, rarely with any previous plan. Teaching art has been my career and jewelry making my passion. 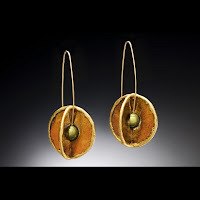 I taught high school art for many years and presently teach jewelry making to adults at the Art League of Long Island in Dix Hills, New York. It makes for a good balance. I have also authored three books and, although writing initially did not come easily to me, I found that, with practice, it was enjoyable to share my technical expertise with others. Being a teacher, I had a wealth of projects and techniques at my fingertips and was used to explaining processes in complete and easily understood detail. By my third book, I sailed along smoothly, no longer having to struggle with the words. It was important for me to create projects that encouraged an individual approach so that each reader's work emerged from his/her own unique vision. It was also important that the examples illustrating the books be of the highest quality of craftsmanship as well as creativity. I especially enjoyed visiting the studios of the artists and seeing their work in person. It intrigued me how they each arranged their workspace and how they employed different techniques to create the effects they were going after. I learned a great deal in the process. I have spent the past three years creating my found object body of work. This past year I showed in group exhibitions at several galleries, as well as the Hillwood Art Museum along with jeweler Robert Dancik. I just completed my website www.alicesprintzen.com a few weeks ago and am interested in finding a high quality venue to showcase my work. Currently my work is on display at the B.J. Spoke Gallery in Huntington, New York. To fledgling jewelry designers, I advise working from your own vision. If you don't have a strong one as yet, keep traveling in new directions and keep an open mind. Follow your ideas even if you have no notion of where they will take you. Don't take the safe route and work in inexpensive materials so that you can throw out what isn't working without loosing a night's sleep. What fun it was to spend time viewing Alice's work and learning more about where it comes from--physically and mentally--look for her name to become "a name" very soon, I am quite sure! I found Keith Lewis on metalcyberspace and was instantly transfixed. I thought his images radiated joy and happiness so I sought him out to find out more about the man behind the work. What I found was a person with a rare sensibility and wonderful sense of humor. Take a few minutes to enjoy Keith! I want to make someone’s favorite earring. While that may sound more like motivation than style, if I want someone else to like the piece of jewelry, then I certainly have to feel good about designing and making it. I truly enjoy creating jewelry, and perhaps this comes across stylistically. I am most drawn to techniques that bring out some unique quality of the material with which I am working. 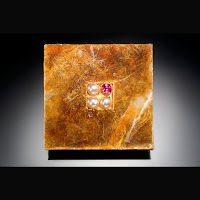 So, high heat processes with copper, electricity with niobium, chemical patinas with brass, roller forming with soft metals like silver are all techniques that showcase something that a particular metal does well. My hope is that the design ends up looking natural because I’m not forcing anything. What are your influences and where do you get your inspiration? I realize that I am out-designed every day by a mollusk. Have you ever looked at one of those amorphous slimy blobs in a shell? And yet, when I look at the pearl it creates, I know I’ll never make anything that wonderful. Have you ever just watched the colors of a soap bubble change from watermelon pink to lime green to teal to hot pink then blue, purple and finally bronze as it thins out? That’s exactly the phenomenon found in Niobium as I anodize it. How about the colors on old copper flashing or brass faucets? The world is full of the most creative wonders you can imagine, and I feel like I am collaging with some of them. 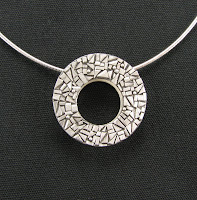 How did you first come to jewelry design and when did you decide to make it your career? I had some other businesses earlier that foreshadowed what I do now. My first venture was going door to door in my neighborhood selling dirt. The profit margin was the best I’ve ever achieved since it wasn’t even my dirt, and as a seven year old I had low expenses. I moved on to collecting golden corn silk and bits of crushed glass in a cigar box, which when you think about it is rather jewelry-like. My first actual jewelry-focused activity was at twelve years old (40 years ago) in Seoul, South Korea in a craft shop where I learned to cut cabochons. I realized I had to work for myself while I was in undergraduate school in Oklahoma. At the time I was working in an all-you-can-eat-until-2AM pizza joint right next to the Oklahoma Sooner Football stadium; that might have helped me realize I needed a plan... Though, I truthfully don’t think going into business for yourself, especially in the arts, is as much a decision one makes as it is a path one fulfills. (Probably a stupid decision, but can be a wonderful path). Finding an audience is easy. The hard part is getting them to find me. If you’ve spent any time at a craft show, I’m sure you’ve experienced some kind of mental work stoppage; it’s easy to become numb to the visuals and just walk by the booth. How many tiny things can one see before it all blends together and you just end up walking down the aisle talking to your friend about how bad the food is? I can only hope that enjoying what I do and feeling confident in the integrity of my work somehow comes across and is noticed. That, and I try to get big booths. This is too big a question for someone who likes to hear himself talk to answer here. 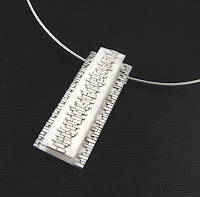 Briefly, I have moved from using predominantly silver in my designs to silver together with a wide variety of materials while keeping the general feel of sterling jewelry. So, when silver goes from 9$ per ounce to 18$, my Cost of Goods component does not have to double as well. That makes my modest price increase look almost like a relative price decrease compared to others. I certainly have had to become more directional and purposeful in my business, and thankfully I’m married to Lisa who is patient enough to stay calm until I realize that her suggestion is the right one. Some Swedish friends of mine occasionally remind me of their proverb: “There is no such thing as bad weather, just bad clothes”. To me this says one needs to not get flustered, keep a positive attitude and plan realistically. I know if you are just starting, this may sound condescending or overly simple, but if you get flustered you’ll have no chance of being effective, if you don’t stay positive you’ll let yourself be ground to a pulp, and if you don’t have a plan that you can compare to reality you’ll end up spinning your wheels. You can do it, regardless of the weather. Once you get started, visualize your trajectory. Where will you end up if you keep doing what you are doing? Has working all the time instead of having a life lost it’s rosy glow? Facing the “bad weather” and making even a small change can have big and long-lasting and terrific consequences. One of my biggest mistakes was to nearly always choose to work harder and that’s not always the way to go. In the end, you have to feel good about what you’ve done. I came across Harriete Estel Berman's work through the Ganoskin Orchid Gallery. What fun it was to find her fascinating and unusual pieces using what she refers to as "post-consumer" materials. Enjoy a few minutes with Harriete! With the economy on every one's mind, how has this affected your business and this industry? 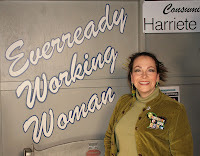 I love Harriete's unique point of view and vision used to create her fabulous jewelry!